* 8 levels magnetic resistance can be manually adjusted from light and progress to heavy. * Extruded aluminum seat slide rail provides incredibly smooth motion. 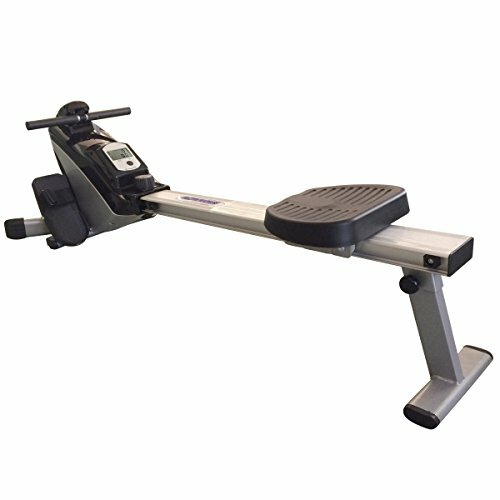 Oversize footrests offer a natural pivoting action providing a full longitudinal rowing motion. * Durable rowing straps with foam hand grips keep hands stable and comfortable while rowing, thick padded seat provides smooth performance and maximum comfort. * Provides a great cardio workout for arms, legs, shoulders and back. * Multi-function LCD monitor displays - Time, Count, Count/Min, Calories, Total Count, Scan. The monitor has no Pluse function. * Assembled dimension: L:60 x W:23 x H:18 inches, folds for storage to L:18 x W:23 x H:57.5 inches, User capacity weight: 250 lbs. 8 levels magnetic resistance can be manually adjusted from light and progress to heavy. Extruded aluminum seat slide rail provides incredibly smooth motion. Oversize footrests offer a natural pivoting action providing a full longitudinal rowing motion. Durable rowing straps with foam hand grips keep hands stable and comfortable while rowing, thick padded seat provides smooth performance and maximum comfort. Provides a great cardio workout for arms, legs, shoulders and back. Multi-function LCD monitor displays - Time, Count, Count/Min, Calories, Total Count, Scan. The monitor has no Pluse function. Assembled dimension: L:60 x W:23 x H:18 inches, folds for storage to L:18 x W:23 x H:57.5 inches, User capacity weight: 250 lbs. If you have any questions about this product by ActionLine, contact us by completing and submitting the form below. If you are looking for a specif part number, please include it with your message.